Here is the link on the American Rhododendron Society website to Rhododendrons International, which features articles on the research, discovery, promotion and cultivation of rhododendrons internationally. Rhododendrons International is a new on-line rhododendron journal not associated with any existing rhododendron organization (but supported by all existing organizations) that will bring forward articles in English on any aspect of rhododendrons that are perceived to be of wide interest to rhododendron enthusiasts world-wide. It is being made available at no cost on the websites of most, if not all, of the world's rhododendron societies and organizations. The first volume, available here as three geographically-based parts because of the large size of the volume, contains descriptions of all of the existing world's rhododendron societies, prepared by members of the respective societies. Material for future issues will largely be drawn from modified articles published in existing rhododendron society journals. Future issue publication dates are likely to be annual, but this will depend on the timing and amount of material submitted for publication. 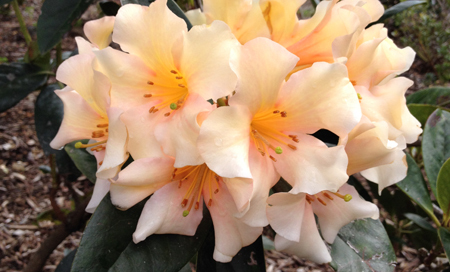 Articles for consideration of publication should be written in English, which along with photos can be submitted to Dr. Glen Jamieson at rhodojournal@gmail.com with "Rhododendrons International" in the subject line. Further submission information is in the "From the Editor" introduction in Rhododendrons International, Volume 1.